BBC Two has released the first promo image from Line of Duty series 3! 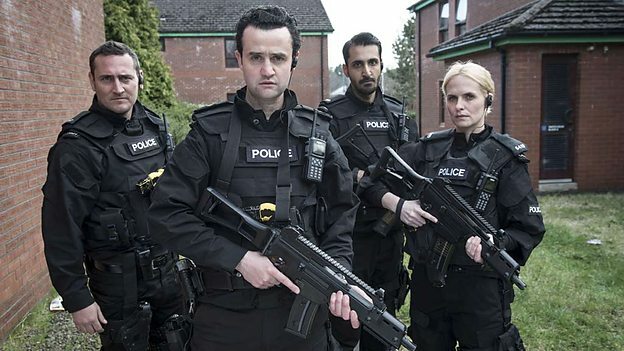 With filming well under way for Line Of Duty series three, the BBC has today unveiled the other officers in the Armed Response Unit joining Daniel Mays’ (Mrs Biggs, Public Enemies, Made In Dagenham) character Sergeant Danny Waldron. Will Mellor (Broadchurch, The Street) plays PC Rod Kennedy, Arsher Ali (The Missing, Silent Witness) plays PC Harinderpal ‘Hari’ Bains and Leanne Best (Ripper Street, Fortitude) plays WPC Jackie Brickford. The commissioner for BBC Two is Kim Shillinglaw, Controller of BBC Two and BBC Four, and Ben Stephenson, Controller of BBC Drama Commissioning. The executive producers are Jed Mercurio (Lady Chatterley’s Lover, Critical) and Simon Heath (The Great Train Robbery, The Fear and The Bletchley Circle) for World Productions, and Stephen Wright for BBC Northern Ireland. With support from Northern Ireland Screen. The producer is Peter Norris (Nylon, Between The Lines). Michael Keillor (Critical, Silk) will direct episodes one to three and John Strickland (Bodies, Prime Suspect 2) will direct episodes four to six.